The Norwalk Board of Estimate and Taxation holds a public hearing, Wednesday in City Hall. Updated, March 27: Additional information; 12:47 p.m.: Additional information. 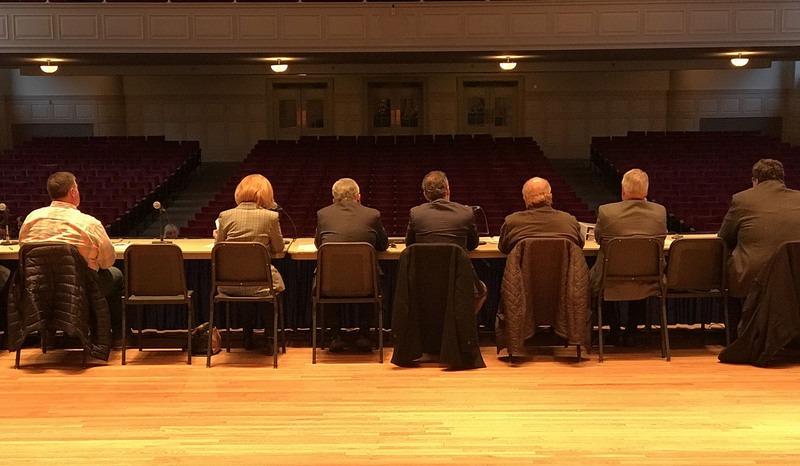 More than a thousand empty chairs greeted the Norwalk Board of Estimate and Taxation last week at its annual public hearing on the proposed operating budget, held in Norwalk Concert Hall. Only longtime activist Diane Lauricella showed up to offer an opinion. “I’m always surprised that more citizenry does not participate, because I know you all work on this budget, as did your staff and department heads, for hours. It might mean that people don’t understand the budget,” Lauricella said. The environmental advocate has attended nearly every BET public hearing on the budget for at least the last eight years. She nearly skipped this one, she said. “There are certain items that I don’t believe you people, all of you up here, have been given a straight answer, enough information, from your departments,” Lauricella said, repeating a concern she has expressed year after year about what she feels is the City’s lack of a comprehensive energy management program. Board of Estimate and Taxation Chairman Ed Camacho tried to keep her to three minutes. “There’s nobody here,” she protested. Camacho relented and Lauricella continued with 10 minutes of criticisms of the City budget. The Board of Education hasn’t turned over every leaf to save on energy costs, she said. “I do not believe they deserve to get all of the $6 million from the Rainy Day Fund,” Lauricella said. Mayor Harry Rilling replied that the BoE isn’t getting $6 milion. The $6 million draw down from the Rainy Day Fund is slated to be split, with $2.3 million going to Norwalk Public Schools for one-time expenses. Faced with the cavernous empty space, Camacho announced that the public hearing would be extended for 15 minutes to allow for the possibility that perhaps some citizens had gotten stuck in traffic. After that recess, no new speakers arrived, and the hearing closed. The Common Council is set to vote Tuesday on a $1.5 million contract with Blinder Belle Architects and Planners LLP for architectural design services on the Maritime Aquarium’s planned new 4-D theater. The Aquarium’s existing IMAX theater is set to be demolished to make way for the Connecticut Department of Transportation’s reconstruction of the 123-year-old railroad bridge over the Norwalk River, commonly known as the Walk Bridge. Plans stalled when bids for the plan as designed by Aquarium leaders came in over budget. “Given that we are in lower Fairfield County, the difficulty of construction with occupancy, the time constraint for the completion of the new 4D Theatre as required by DOT, and the space limitation of the site, there was limited bidder interest and the bids received were significantly higher than the estimates,” Building and Facilities Manager Alan Lo wrote to NancyOnNorwalk on Monday. The Norwalk Department of Public Works began reconfiguring the project and the Council worked to change the working agreement with the state, so that the City would take the lead. The Aquarium’s plans for the theater were an estimated $34.5 million, Maritime Board of Trustees Co-Chairman Michael Widland said in May. The new project budget is capped at $40 million, Lo wrote to Council members on March 14. “We are working together to evaluate the scope of the functional replacement project and to proceed with redesign of the project,” Lo wrote. The new theater design will be 1,000 square feet smaller, and will be shifted to the east to avoid a 54-inch sanitary pipe, documents show. Design is expected to complete in five to six months. The law department is developing amendments to the working agreements, as approved by the Council. “The City will be the contracting entity for all project related services and work,” he explained. BBB has completed new schematic designs to “capture construction cost savings as part of our efforts to meet the budget cap,” and has submitted a new fee proposal, he wrote. “With the restructuring of the project implementation process, we are incorporating a reduction of project scope, reconfiguring the footprint of the additions to reduce building square footage, further assessing the constructability of the building, refining while simplifying the bid specifications, and identifying means to attract more bidders. Also, the completion date has been extended,” Lo wrote Monday. The Council Personnel Committee on Wednesday voted to approve job descriptions for a Human Services Director and a Chief of Community Services. These are among the last remaining positions related to Mayor Harry Rilling’s reorganization of top administrative personnel. This social services-oriented addition to City government was held back when the Norwalk NAACP objected to the plan to eliminate the Fair Housing Officer. The new plan would move the Fair Rent Officer position out from the Redevelopment Agency and into City administration, and keep the Fair Housing Officer intact in accordance with the legal decree that requires it. “I think a lot of people are saying there’s a lot of services that are being offered by several different entities in the city but nobody’s coordinating the effort. So, in some cases you have duplication of services,” Greg Burnett (D-At Large) commented. Burnett asked Director of Personnel and Labor Relations Ray Burney if the new Chief would coordinate services among the city not-for-profits. A man had sought help on Facebook that day, describing himself as 75 years old and disabled due to a stroke, and needing a $500 loan to help him buy a battery for a “power chair,” and other medical supplies, Burney said. It would be nice if there was a City employee who could assist someone like that, he added. Norwalk “should have a city person who says, ‘I’ll take care of that,’ and we don’t,” Burney said. The new Chief would be paid $140,000 a year, a cost-neutral addition, as the job replaces the Human Relations & Fair Rent Department Director position formerly held by Adam Bovilsky. The new Human Services Director would be paid $100,000 a year, Burney said last month. Smyth said the proposal needs to be approved by the Council Finance Committee before being voted on by the full Council. Never before in modern Norwalk history has an opening budget hearing gone attended. Visible evidence of a City electorate’s lack of confidence in how our City is managed. Make no mistake about it. This “news” has traveled far and wide advertising Norwalk as a failing City and bodes poorly for our future. Norwalk desperately needs elected officials with the management and business skill sets to competently govern a City in difficult circumstances. why attend,the council and the mayor are going to do what they want. we really ave no say with this group. Last year more than 30 people attended the BET’s budget hearing, which was unusual. I would like to see data on how many people use the IMAX theater now. I know the cost deters a great number of people from attending. In addition, how are IMAX theaters doing across the country? For clarification, I did not dispense “10 minutes of criticisms” but did give well thought out and researched opinion and ideas about specific line items in this budget. Please NON it feels a little like killing the messenger by reducing my civic duty into a merely “habitual” exercise. Jeez. I totally agree with caro, it is very unfortunate that the taxpaying home owners have no voice in Norwalk. We are forced by the all democrat council except Mr. Hempstead who think they know better than we do. They close the door make decisions ask us what we think, then do what they already decided they would do in their closed door meeting. We have no voice and people are tired of wasting their valuable time. I hope we have a big change in November the only time we have a voice, but I have learned from the past people in Norwalk forget easily. It’s a shame! I will vote for everyone and anyone not currently in city government except for the BOE, I want big change, I don’t forget, I have been to too many meetings and see what goes on and I don’t like it. ^this! I agree with Al. Let’s make it so.